Stolk Labs, Inc. was founded September 20, 2016, by David Stolk in Richardson, Texas. David previously worked at Metallurgical Engineering Services (MES) in Richardson, Texas. During his 26 years at Metallurgical Engineering Services, he acted as Vice President, Surface Specialist, Failure Analyst and Electron Microscopist. His passion for this industry led him to open his own independent testing laboratory where he could provide metallurgical testing, mechanical testing, chemical testing, material failure analysis, and surface analysis services. He is experienced in the forensic investigation process behind product failure analysis and provides in depth research and supportive documentation for all claims investigations. Double doors and a fork lift can accommodate large crates or heavy industrial parts. Stolk Labs is a 10,000-sq. ft. lab with an efficient floor plan designed to expedite test samples according to standard ASTM guidelines. This upscale, clean environment isn’t your typical laboratory setting. Stolk Labs houses a chemical lab, mechanical lab, metallurgical lab, surface analysis lab, and joint investigations lab with a conference room and lounge equipped with easy chairs, a coffee bar and cold beverages. 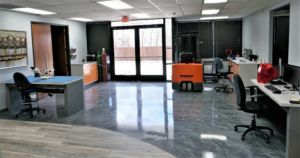 We are an independent materials testing lab specializing in metallurgical failure analysis with one of the top surface scientists in the country. With over 30,000 tests completed, and counting, our experience can help answer and solve a variety of different questions. Our staff experts can help troubleshoot material defects, failure points, critical dimensions, and more. We have problem solving experience in a variety of industries. Stolk Labs is ISO/IEC 1702:2005 accredited through PJLA and we are confident we can help you. Review our Certificate and Scope of Accreditation. Feel free to download and save for your records. We are a proud member of the Richardson Chamber of Commerce. We'd love to talk with you, whatever your needs are. Even if you're not sure whether we can help, we'd love to chat. Think we did a good job? Drop by Google and leave a review; it would really help. © 2019 Stolk Labs · All rights reserved.